La-z-boy Tara from the la-z-boy's inspiration range which is their modern range. 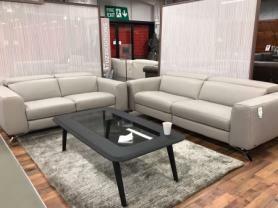 Slim design with high backs this sofa ticks all boxes. La-z-boys renowned for its quailty and pocket sprung most comfortable seats. This 3 seater comes with 2 power recliners , one on each side with USB charging ports on either side so that you can charge your favourite gadgets. Leather is amazing grey colour which is most popular.